Home Digital Marketing search engine optimization website optimize How To Increase Google Crawl Rate For Your Website? How To Increase Google Crawl Rate For Your Website? All these time, you’ve been waiting for Google to love your website.You tried to woo Google but, sadly, your efforts had gone unnoticed. The love was one-sided and not reciprocated. I’ve got some good news! You can put your mind at ease. All along you’ve known the secret formula to make Google fall in love with your website . Googlebot is the name given to Google’s web crawler. Google crawl rate is the frequency at which Googlebot visits your website. It will vary according to the type of your website and the content you publish. If Googlebot can’t crawl your website properly, your pages and posts will not get indexed. Keep in mind that you cannot force Googlebot to love you. Instead, send an invitation to show how amazing you are. Without further adieu, here are some of the measures you can take to increase Google crawl rate. One of the most important criteria for search engines is content. Websites that update content on a regular basis have a good chance of getting crawled frequently. To improve Google crawl rate, it is recommended that you post content three times in a week. Instead of adding new web pages, you can provide fresh content via a blog. It is one of the easiest and cost effective ways to generate content on a regular basis. To add variety, you can also add new videos and audio streams. Crawlers have limited time to index your website. If it spends too much of time accessing your images or pdfs, it will have no time to check out other pages. To increase your website load speed, have smaller pages with fewer images and graphics. Keep in mind that embedded video or audio can be problematic to crawlers. Every content on the website should be crawled but, sometimes it’ll take a long time or worse never be crawled. Submission of sitemaps is one of the important things you have to do make your site discoverable by Googlebot. With a sitemap, a website can be efficiently and effectively crawled. They will also help to categorize and prioritize your web pages accordingly. So the pages that have main content will be crawled and indexed faster than the less important pages. If Google is suffering from longer load time, there is a good chance of your visitors going through the same. It doesn’t matter if your webpages are optimized for speed. If your server response time is slow, your pages will display slowly. If this is the case, Google will actually point this out on the ‘crawl rate’ page of Google Search Console. You can set it to ‘Faster’. Additionally, use the hosting you have efficiently and improve your site’s cache. Copied content will decrease crawl rate as search engines can easily identify duplicate content. Duplicate content is clear evidence that you lack purpose and originality. If your pages have duplicate content beyond a certain level, search engines may ban your website or lower your search engine rankings. If you have a large website, you may have content that you don’t want search engines to index. Example, admin page and backend folders. Robots.txt can stop Googlebot from crawling those unwanted pages. The main use of Robeots.txt is simple. But, using them could be complex and if you make a mistake, it can banish your website in the search engine index. So always test your robots.txt file using Google Webmaster tools before uploading. Only if images are optimized, they will be displayed in search results. Crawlers will not be able to read images directly like humans. Whenever you use images, make sure to use alt tags and provide descriptions for a search engine to index. The same notion is applicable for videos. Google is not a fan of ‘flash’ because it can’t index it. If you are having trouble optimizing these elements, it is better to use them minimally or avoid using them altogether. When you interlink blogs within your own blog, Googlebot can crawl deeply in your websites. Interlink old posts to new ones and vice versa. 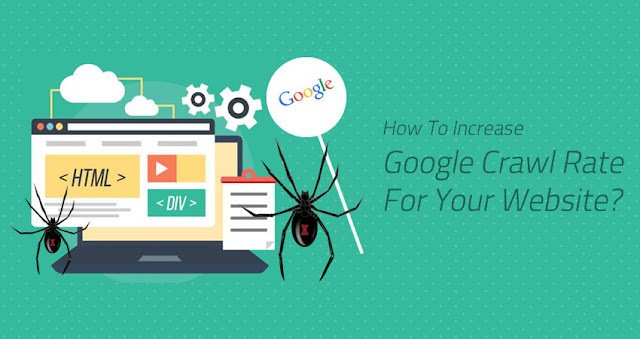 This will directly improve Google crawl rate and help you get higher visibility. Whenever you add new content to your website, use ping services to inform bots about the update. It is equivalent to waving a flag and asking the search engines to check out the new content. Pinging is a good practice to follow as it can make a noticeable difference to how quickly your pages get indexed. While pinging is definitely worth doing, results are not guaranteed and may vary. You must work on building backlinks and follow the best SEO practices. If you have included any black hat SEO tactics, you must remove all the related outcomes as well. This includes keyword stuffing, usage of irrelevant keywords, content spam and link manipulation and other techniques. Usage of black hat SEO techniques translates to a low-quality site for crawlers. Only use white hat techniques to increase Google crawl rate. High-quality backlinks will improve crawl rate and indexation speed of your website. It is also the most effective way to rank better and drive more traffic. Even here White hat link building is a reliable method. Refrain from borrowing, stealing or buying links. The best way is to earn them by guest blogging, broken link building fixes, and resource links. There is no proof that social shares will influence search ranking but, they help new content to get indexed quickly. For instance, Facebook doesn’t allow bots to crawl information that isn’t public and Twitter doesn’t allow any results to be crawled at all. If you perform a quick robots.txt check on their files to verify. Still, Googlebot and Bingbot can access publicly available information on social media. Hence getting a decent amount of shares for your content will help in quick crawling and indexing. According to Google, Crawl rate is not a ranking factor. You will get more organic search if your website is in a good place on SERPs. This will happen if you have a decent crawl rate. So every search engine marketing strategy must consider a website’s crawl rate. It is possible to increase Google crawl rate but, it will not happen overnight. You have to be patient. Apply the above recommendations to your entire website and with time, the love will be mutual. You will definitely get more traffic for your individual pages too. What are the techniques you follow to improve crawl rate for your website? Feel free to comment below.